With more than three decades of clinical experience and over a million patients treated, statistics confirm a success rate of nearly 95-98 percent*, and even higher for the bridges they support. Dr. Fatehi will place the dental implant post. Your general dentist will place the actual tooth (crown). Our office works hand-in-hand with your general dentist of choice to ensure all of your appointments are to be made. The fee for tooth replacement with dental implants depends on several factors, including the number of teeth being replaced and the number of dental implants required to support your replacement teeth. Some additional procedures may be required prior to the placement of your dental implants to ensure the long-term health of your dental implants, such as socket grafting or sinus augmentation, the need for a surgical guide, method of anesthesia, etc. To obtain a specific fee estimate, it is necessary to have a consultation with our office to determine a treatment plan for your specific needs. Anyone who is missing one or more teeth due to injury, disease or tooth decay may be a candidate for dental implants. The determining factor is the amount of available bone. Both, Dr. Fatehi and your general dentist are the best persons to evaluate whether dental implants are a viable solution for you. Occasionally, older patients express concern that their age may prevent them from enjoying the benefits of dental implants. However, health is more of a determining factor than age. If you’re healthy enough to have a tooth extracted, you’re probably healthy enough to receive dental implants. Certain chronic diseases may contraindicate dental implant treatment. Your dentist will determine if you are a candidate for dental implants after a careful evaluation of your dental and health history. If you have dentures you can also inquire with your general dentist or Dr. Fatehi to see if an implant supported denture is an option for you. Improved appearance: When you lose the entire tooth - crown and root - shrinkage of the jawbone may cause your face to look older. Dental implants can stop this process. A traditional denture or dental bridge doesn’t. In many cases bone grafting will be necessary before the placement of the implant post. Permanent solution: There are no loose parts to worry about losing. The dental implant is stable and comfortable. No adjustment is need after placement. Normally, it will serve its owner for life if hygiene and care is maintained like natural teeth. The process of receiving dental implants requires a number of visits over several months. Radiographs and impressions (molds) are taken of the jaw and teeth to determine bone, gum tissue, and spacing available for an implant. A treatment plan is drawn up between your dentist and Dr. Fatehi. With either local anesthetic or intravenous sedation, the surgical area is anesthetized, the implant(s) will be surgically placed into the bone and allowed to heal and integrate onto the bone for up to 3 months. (If a sinus graft procedure was performed to increase the bone height in the posterior upper jaw, 6 additional months of healing time is necessary). 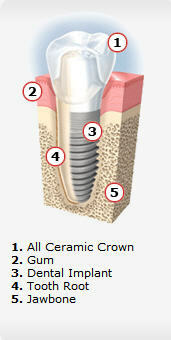 After the placement of the implant, a healing cap is placed on the implant which is usually sits flush against the gum. After approximately 3 months of healing, an abutment (post) is attached to the implant (usually without the need for any local anesthetic) and the general dentist fabricates the final crown usually within 2-3 weeks. Because several fittings may be required, this step may take one to two months to complete. The new prosthesis will provide excellent stability and comfort to the patient. With any surgery, there can be some discomfort. Placing one implant normally causes less discomfort then placing several. Anesthesia and patient sedation are commonly administered to help reduce any discomfort during the dental implant process. Most patients report that they were much more comfortable following the procedure than they had anticipated. Dr. Fatehi will prescribe medications to ease any discomfort that may occur if necessary. It is normal to have some bruising and swelling in the gum and soft tissues. But usually the discomfort, if any, is treated with an ordinary painkiller. You should expect to be able to work the next day if a single implant is placed. Your new teeth must be cared for and checked regularly, just like your natural teeth. Brush and floss as recommended by your dentist or dental hygienist. See your general dentist in six months, or more frequently if so advised.